Several years ago, I wrote an article about Groundhog Day for a Christmas site, including some observations on the Bill Murray movie of that name. A friend who publishes a Christmas newsletter recently reminded me of it, and I re-read it to see if it needed any updates. I began working with a circle of musicians who are working toward some definition of success and sharing their ideas freely with each other. In my day job, I begain working in and training people on project development methodologies that involve breaking deconstructing huge projects down into little ones you can work through in a series of iterative cycles. I had already begun to see how those two elements of my life could be coming together, when I was reminded of Phil’s journey in the movie. And the truth is, it is surprising how well the notion of musicians using small interative cycles to work toward their goals seems to work. Often you learn things during the project you didn’t realize before, so your plans either change or become obsolete. Often project requirements change, so your plans change anyway. Let’s take a look at how attacking your big goals in a series of short, iterative cycles can help you make useful progress on an ongoing basis. I admit that the first part of following list looks like every other “how to define your goals and stay on track” list ever made. But that’s just laying the foundation for the way you attack that list. Determine your overall goals for your music career or avocation or? 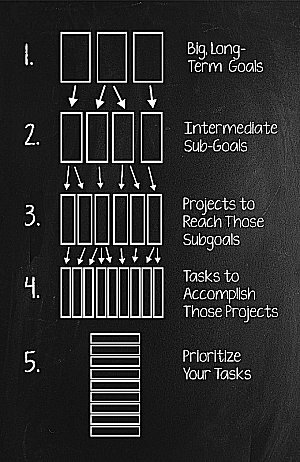 Break down the goals (or at least the higher-priority ones) into smaller projects. Prioritize the tasks with the ones that you need the most or that make sense to start first. For example, you’ll want to put links to your web page in your social media pages, so it might make sense to start the web page first. 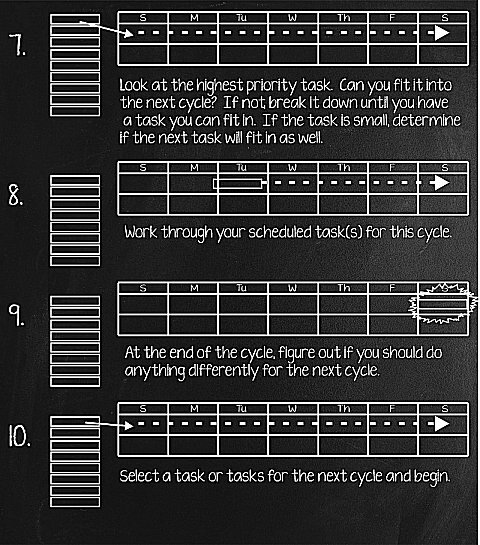 Determine how long your work cycles should be. In Agile Scrum this period is called a “sprint.” The idea is that most people can keep up a sustained effort on almost anything if they know they only have to do it for a short time. Consider starting with a one or two-week cycle at first, with the understanding that you’ll only be working on 1-3 tasks in your list during that time. Everything else can wait. You can change your cycle length later if you need to, but it’s a bad practice to change the deadlines while you’re in a cycle). This is where things diverge from old-fashioned “make-a-list-and-start-on-it” methods. The list is NOT your driver – the timeframe you choose is your driver, and you only worry about the task or tasks you’ve promised yourself to get done in the next cycle. Starting with the highest priority task and working your way down, determine which task or tasks you think you can get done in that period. Work the plan. Don’t get side-tracked. Don’t let someone (even your own alter-ego) bully you into dropping what you’re working on and starting on other tasks. At the end of the cycle, figure out what’s working for you and what isn’t. Make any ajustments necessary. Plan and start the next cycle. In 2018, it could be argued that – at the very minimum, you need the following to get started. In January, 2018, it seems that you need all of the above (and then some, I admit it) just to demonstrate that you are taking yourself seriously. So you can’t focus your attention on getting everything perfect and professional from the start. Spending all of your money having someone else do that. In the early stages, don’t kill yourself to be “mindblowing” – for one thing, you’ll be learning as you go, tastes will change, and things you thought were brilliant early on will seem tacky and immature later REGARDLESS of how much you work on them in the beginning. And don’t forget to include practicing your core instrument(s) and songwriting (if that’s your bent) regularly as well. Let’s get back to Phil Connors, the beleaguered weatherman of Groundhog Day. Sure, (spoiler alert) Phil starts out as a narcissistic jerk who doesn’t have any intention of self-improvement before he falls honestly in love and realizes that he doesn’t deserve the object of his affections. But once he starts trying to be a better person, he doesn’t get there overnight. He starts taking piano lessons and sounds really bad for a very long time. He learns ice carving. He learns French. He learns compassion. And he does them all in parallel, a little bit at a time. Then you can set up the other places like your YouTube, Facebook, and Twitter pages, with similar graphics, so people who’ve followed you from one place to another will know it’s still you. A week or a month from now you may decide that you chose the wrong look. Fine, go back and change those resources. I guarantee that you will anyway, eventually. But if you try to get everything perfect the first time out, you’ll never get to most of the OTHER things you need to get done. How Long Does This Take, Anyway? As an adult who stopped taking piano lessons in his youth, I estimate that Phil was caught in his time loop for somewhere between two and three years, depending on how much practice time he got in every day. But every day he gets a little better at all of his new skills. Think about this: Phil has no idea how long he’s going to be stuck in the time loop. Any more than you know exactly when you’ll get some kind of reward that makes all of your music effort worth it. Since Groundhog Day IS a romantic comedy, Phil’s love for Rita is sufficient to carry him through years of effort, striving for incremental improvement in several areas at once, with only a few signs that he’s making any progress at all. I have to confess that I know countless musicians who swear their music is the only thing that matters, who give up after a few months of sustained effort. Who knows if one more week – or day – might have made the difference. I don’t, that’s for sure. I do know that most of the successful musicians I know personally have been working on all these things – especially on improving their music and their fan engagement – for years. And they know to keep working on them even after they’ve “made it,” even if they can afford to pay people to take care of the more onerous tasks like HTML tweaking. One thing Phil didn’t have was someone he could touch base with while he was working all of this out. After all, who would have believed him if he had tried to explain what was going on? But you may be able to find folks locally or online who are in the same boat as you. If you will commit to coax, coach, nag, and encourage each other, this will help you stay on track even on the days when you don’t feel like doing ANYTHING for or with your music. If you can get involved with communities that will do the same thing for each other, that’s even better. Songwriter circles, whether local or virtual, like SongTown are very helpful. So are online musician groups like Schwilly Family Circus. Often when I’m so neck-deep in some project that I’m beginning to wonder if it’s worth it, I’ll get an e-mail that says, “Thank you for sharing your story [or for some resource, etc.]. I found it very encouraging.” SAVE THESE in a file to go back and look at when things get discouraging. I am no star, nor expert, but I am a keen observer of what works and what doesn’t. Wherever you are in your musical journey, I’d be glad to hear from you and potentially get you on a mailing list, which talks about my own musical journey, my musical interests, and steps folks like you can take to get a little farther along each day. To contact me with questions or comments, simply go to the Contact Page on this site. To learn more about my “Momma Don’t ‘Low” mailing list, go to this page. Best of luck in all of your pursuits, and keep the music coming!